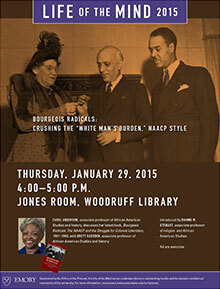 “Bourgeois Radicals: Crushing the ‘White Man's Burden,’ NAACP Style” is this year’s Life of the Mind lecture, presented by Carol Anderson, associate professor of African American Studies and history, on Thursday, Jan. 29, at 4 p.m. in the Jones Room of the Woodruff Library. Anderson will discuss her latest book, “Bourgeois Radicals: The NAACP and the Struggle for Colonial Liberation, 1941–1960” with Brett Gadsden, associate professor of African American Studies and history. Anderson and Gadsden will be introduced by Dianne M. Stewart, associate professor of religion and African American Studies. Anderson’s book, published in 2014, explores the key role of the National Association for the Advancement of Colored People in the liberation of Africans and Asians across the globe even as the organization participated in the U.S. civil rights movement at home. The NAACP's leaders wanted to stave off communism in Africa and Asia, yet prevent capitalist exploitation, and felt the best way to achieve that was to embed human rights, with its economic and cultural protections, in the transformation of colonies into nations. The NAACP’s vision of a "third way" to democracy and nationhood in Asia and Africa was only partially realized because of a combination of the Cold War, Jim Crow and imperialism. “Bourgeois Radicals” examines the toll that internationalism took on the organization and its participation in the struggle for human rights. “I consider it a great honor to take part in this particular Life of the Mind lecture with two highly accomplished members of Emory's African American Studies Department, Drs. Anderson and Gadsden,” says Stewart. “As 20th century historians who both engage the public square, I anticipate a stimulating lecture and discussion that will provoke audiences toward a critical choice point and a reckoning with ideas and information they never considered before,” she adds. The Life of the Mind lectures, created and curated by the Office of the Provost and the Faculty Council, offer faculty members an opportunity to share their research in an informal setting with a broad audience of faculty, students, staff and the Atlanta community. Faculty members are invited to nominate themselves or colleagues to participate by contacting Tom Jenkins, senior director, Academic and Strategic Initiatives, 404-727-6635.